Department of Audiology and Speech-Language Pathology under Kulliyyah of Allied Health Science will be organizing a prestigious event; Hearing Aids Handover Ceremony & Appreciation Dinner 2019 in collaboration with Sivantos SDN. BHD. and Malaysia National Society of Audiologists (MANSA). The event will take place on 1-2 March 2019. 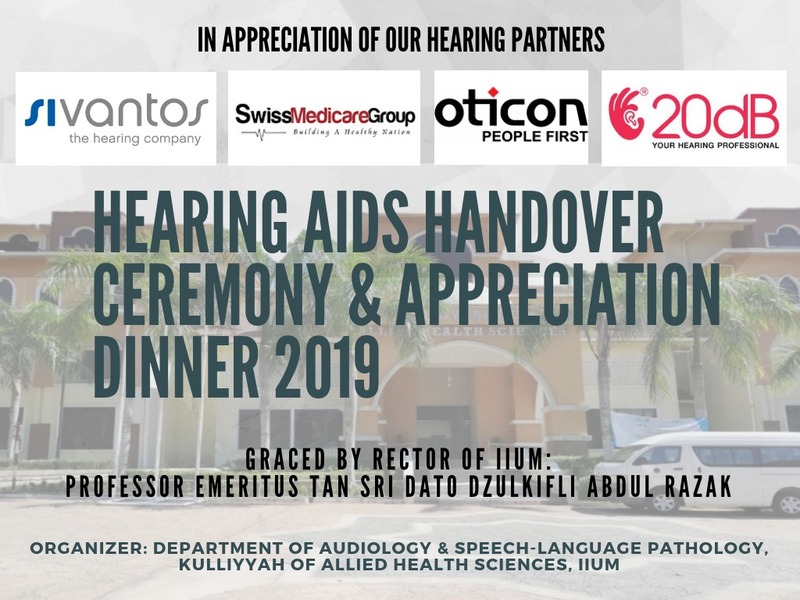 The main objective of this event is to appreciate the willingness of the two top hearing aid suppliers in Malaysia to donate a number of hearing aids amounting RM170 000 collectively. This event will be graced by the rector of IIUM, Professor Emeritus Tan Sri Dato' Dzulkifli Abdul Razak. Alongside the event, there will be a talk by a celebrity Tuan Amin Idris entitled "How to become an 'affective' professional on Saturday.